Bomb that rocked Manhattan contained residue of an explosive that can be picked up in many sporting goods stores. 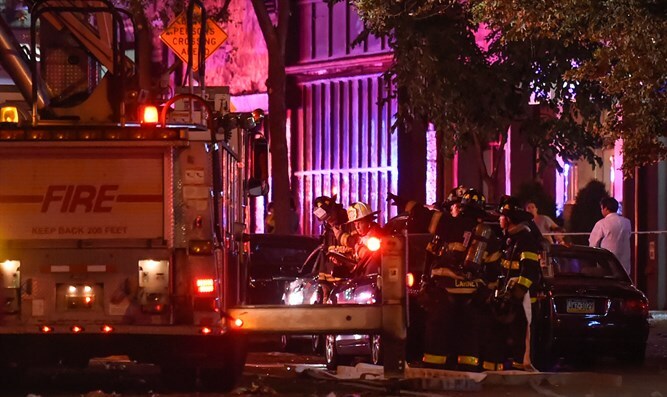 The bomb that rocked a New York City neighborhood on Saturday night contained residue of an explosive often used for target practice that can be picked up in many sporting goods stores, a federal law enforcement official said Sunday, according to The Associated Press. The discovery of Tannerite in materials recovered from the explosion that injured 29 people may be important as authorities probe whether the blast was connected to an unexploded pressure-cooker device found by state troopers just blocks away, as well as a pipe bomb blast in a New Jersey shore town earlier in the day. New York Governor Andrew Cuomo, who toured the site of the blast in Manhattan's Chelsea neighborhood, said there didn't appear to be any link to international terrorism. He said the second device appeared "similar in design" to the first, but did not provide details. "We're going to be very careful and patient to get to the full truth here," New York's mayor, Bill de Blasio, said Sunday, according to AP. "We have more work to do to be able to say what kind of motivation was behind this. Was it a political motivation? A personal motivation? What was it? We do not know that yet." Cell phones were discovered at the site of both bombings, but no Tannerite residue was identified in the New Jersey bomb remnants, in which a black powder was detected, said the official, who spoke to AP on condition of anonymity. Meanwhile, a third incident took place in Minnesota, in which an attacker stabbed nine people in a mall before being shot dead by an off-duty police officer. The Islamic State (ISIS) jihadist group on Sunday claimed responsibility for the stabbing, which the FBI is calling "a potential act of terrorism." So far there are no indications that the Minnesota incident was connected to the others.